The ability to satisfy customers is a product of Apple's core beliefs that run through the organization from the top management to the sales staff at the Apple Store. Visiting an Apple store is an experience in itself. You are in a different world compared to your regular customer service experience. 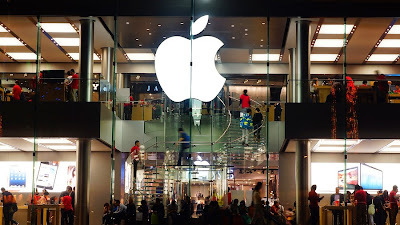 In his book, The Apple Experience: Secrets to Building Insanely Great Customer Loyalty, Carmine Gallo states that "The Apple Retail Store is the most profitable store on the planet." He also reveals that the average Apple Retail Store generates $5,600 per square foot and attracts more than 20,000 customers a week. The ability to satisfy customers is a product of Apple's core beliefs that run through the organization from the top management to the sales staff at the Apple Store. The credo is that "we are at our best when we deliver enriching experiences" and this reflects in the way the stores are run. The ability to deliver these enriching experiences stems from a set of organizational practices over time. When seeking to improve the customer experience with Apple, Steve Jobs set out to find out who offered the best customer service in the world. He started this search with a colleague, Ron Johnson, and it led them to a hotel: The Four Seasons. Innovations from this hotel are so common now that we take them for granted. Innovations such as small shampoo bottles in the bathrooms, and so on. From this, Steve initiated the Apple approach of helping the customer solve his or her problems instead of getting them to buy a product. Apple Store staff are trained to focus on caring for the customer more than anything else. Steve Jobs learnt from a company that was in an entirely different sector than his own, an hotel. I assume that the reason you are reading this article is because you, too, want to improve your business practices and are looking to gain more knowledge on how to do so. You are on the right path. Haven't you ever walked into a store to buy something and there you find the store attendant with a long-face, refusing to smile and being irritable? I know I have, countless times. And such stores I would prefer to avoid. On the other hand, I have also been to stores where the store attendant was so nice to me that I would buy some things I didn't even plan to buy and this ensured my repeat visit to the store. In fact, friendship often develops from this. That's how important it is to focus on things that may seem so little, but have great effect. This is two-pronged. At Apple, much value is placed on the employee (the internal customer), and the external customer. It is no news that Apple is the most valuable company in the world with a valuation of over $700 billion, the first company in US history to top that valuation. But even with this value, Apple still remains one of the most customer-oriented businesses in the world. It is not difficult to find businesses that begin to offend and step on their customers' toes as they grow bigger, forgetting that they are what they are because of these customers. The staff at the Apple Retail Stores are empowered and taught to believe that they are changing the world. They are taught to smile, handle pressure and are highly trained in the art of communication. They are also taught to confidently express their ideas and deliver transformational customer services. As a matter of fact, they are also hired based on their ability to go toe-to-toe with the late Steve Jobs in communicating ideas. For the external customers, the approach to serving them is personalized. At the Apple Retail Store, customer services are not generalized. Each customer is seen and treated as a unique person. Upon getting into the store, the customer will be greeted by a friendly face, and met with eye contact. Also, the staff politely ask questions so they can understand the customer's needs and provide adequate solutions. The aim of the specialists (the staff who talk to the customers about the products) is to always give the customers solutions they can take home today. As the customer departs, whether or not they purchased something, they are greeted with a warm farewell. Question: Does such a thing happen in your workplace? If no, then you have to get to it. The arrangement and design of an Apple Retail Store is simple and neat. This follows Steve Jobs' principle for them to "Get rid of the crappy stuff and focus on the good stuff." The point is, if certain spaces could be useful in the store and there are unnecessary things occupying that space, get rid of such things. Let there be enough room for your customers to move around, without having things blocking there path. This ultimately lead to more interaction, safe to say Apple Stores usually have the feel of an after work happy hours. Also, it is important that you focus on aesthetics. Make your store as beautiful as possible. The truth is, you don't have to decorate the place as that will only clutter your store all the more. Take out unnecessary objects, paint your store nicely, buy cool furniture and keep your floor shiny (if possible). Always remember these sayings: "less is more", and "simplicity is the ultimate sophistication." We all love Apple. I certainly love going to their stores. We cant knock them, solid product plus a solid customer service, a world beater. You may have to copy Apple to differentiate your product. Very apt and timely article with today's results showing $194bn in cash, it's easy to forget their amazing customer service. In reality, a customer issue might not be resolved at the initial stage but they usually don't forget how they were treated. In my view, the key to the approach is training. The benefits of the training investment are satisfied customers, reorders, referrals, and increased revenue. What more can I say. Apple has given customer experience a whole new dimension. Americans are generally known for their customer services and Apple certainly takes it to a whole new level. If you are the first customer in the morning you get a round of applause just for been the first and if you are the last out at the end of the day they do the same. I cant recall any company that does the same. Little wonder they are so profitable. Nicely written David. I had a terrible experience at the Apple Store in Northbrook Court near Chicago. Dozens of people waiting in line with no indication of what the timing would be to communicate with an Apple employee. Why should I have to stand in line for 30 minutes to buy an iPhone--competing with people hoping to get to the Genius Bar? It wasn't worth the $70 rebate--next time I will order on-line or from ATT and sell the old one myself.